Posted in: Radio Control, Traxxas. Tagged: Builds, RC. I need to finish off the back end and lock in the hinge pins. 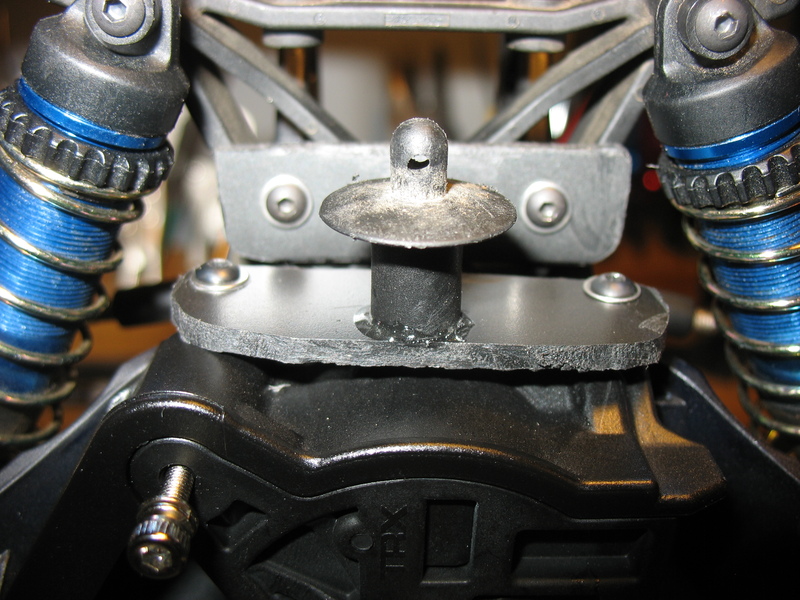 I ended up using the Traxxas Wheelie Bar Mount/Rear Skidplate Set. Part# TRA6777. I actually only used the skid plate piece, you could probably cut the skid plate off of the stock bumper and use it instead, but I wanted a clean look . 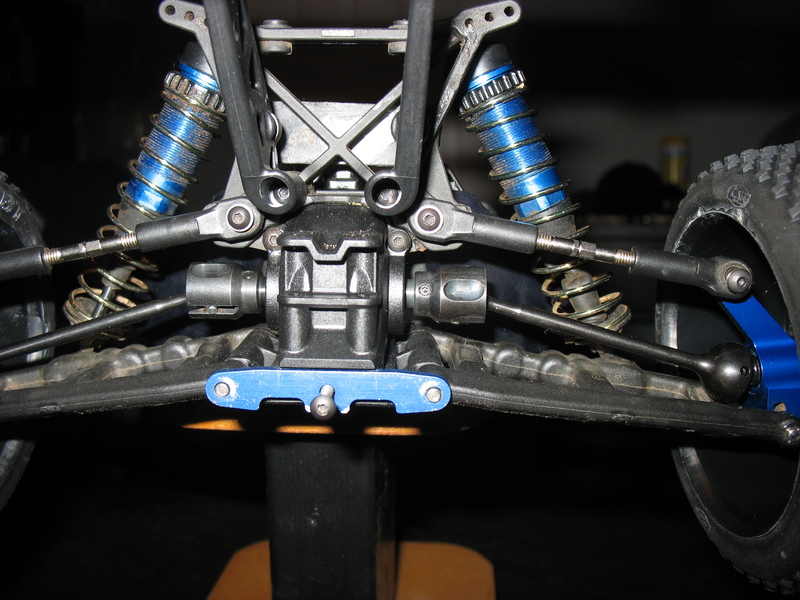 I am going to save the Wheelie Bar Mount for later, I plan on cutting off the Sway Bar mounting points and using them on this buggy, so I will have the option to use sway bars in the future. Now I needed to come up with a way to mount the body to the chassis. After a lot of thinking I decided to us a single post in the front and rear, I have an idea to use part of the Nerf Bars to stabilize the body on the chassis. I got a piece of cardboard and started mocking up pieces. Once I had something I liked, I got out the Dremel, my scrap plastic and went to work. Once I had the piece cut to approx. 5.5mm x 2mm, I then shorted a stock Body Post to a 2omm length. I used a 10mm bcs screw and some epoxy to hold the tow pieces together. 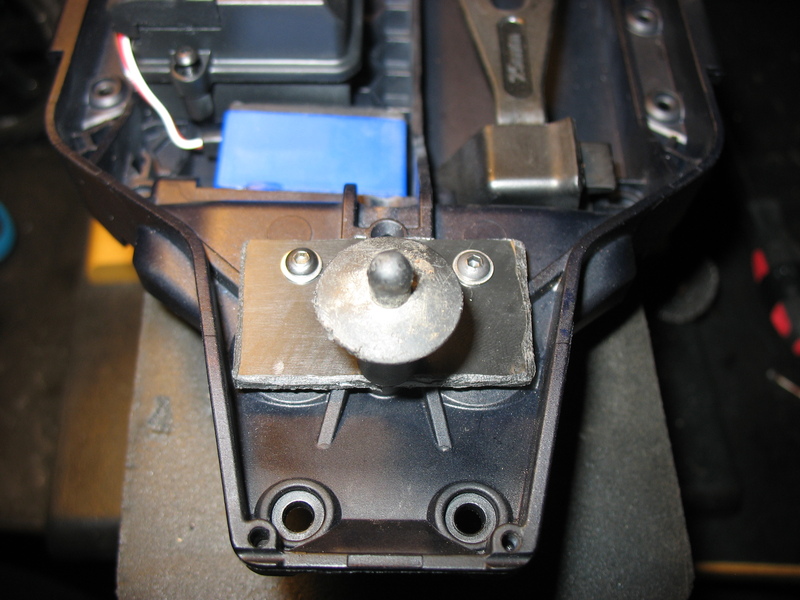 To attach the Rear body Mount, I removed the 10mm factory screws from the gear cover, and got rid of them. 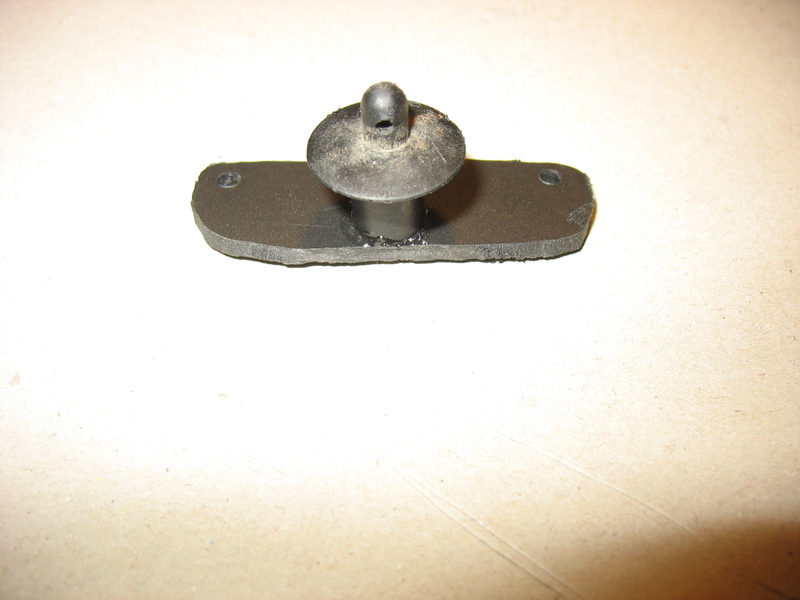 I then attached the body mount on top of the gear cover using some spacers and 18mm screws. 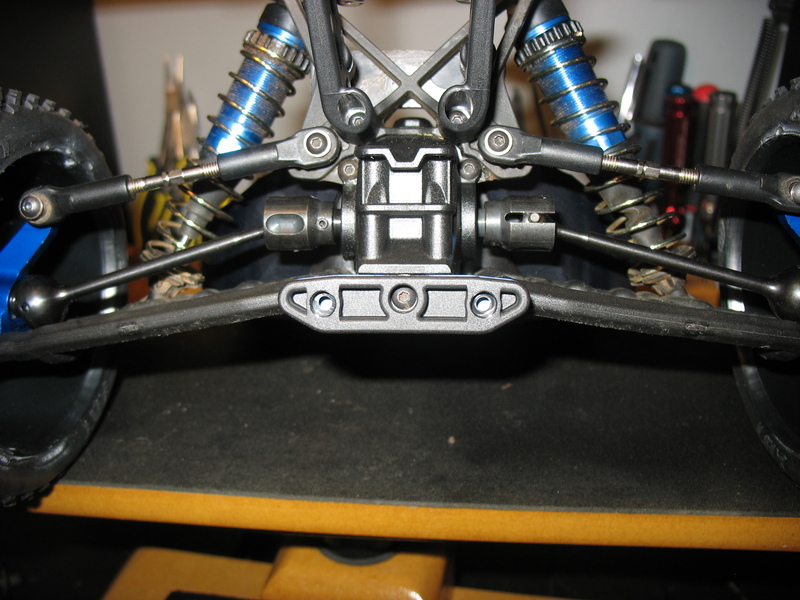 The spacers were used to get the rear body mount as level as possible on the chassis. Next up, I needed to come up with a Body Mount for the front. This was going to be made the same way, with a Body Post attached to a cut up piece of plastic, attached to the chassis. I ended up threading the two holes I have circled in orange, with a T-40 tap. 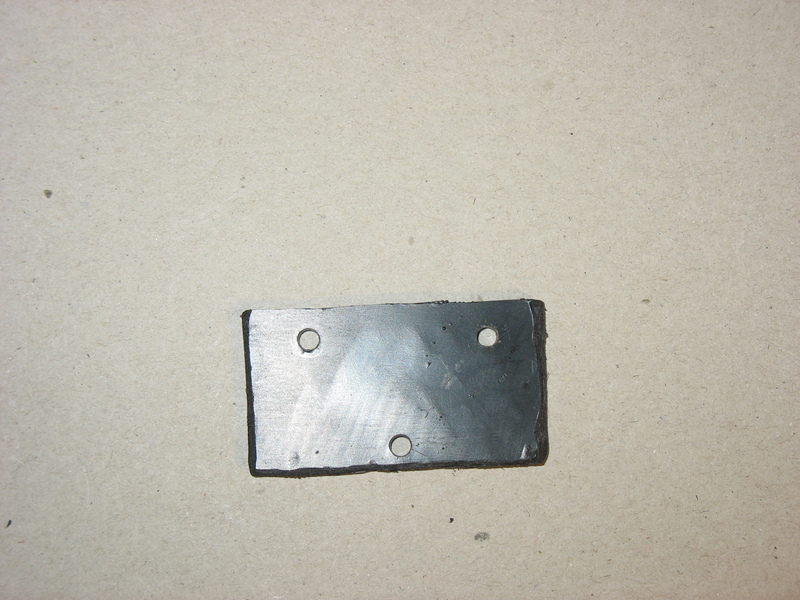 They will act as the mounting holes for the Body mount plate. 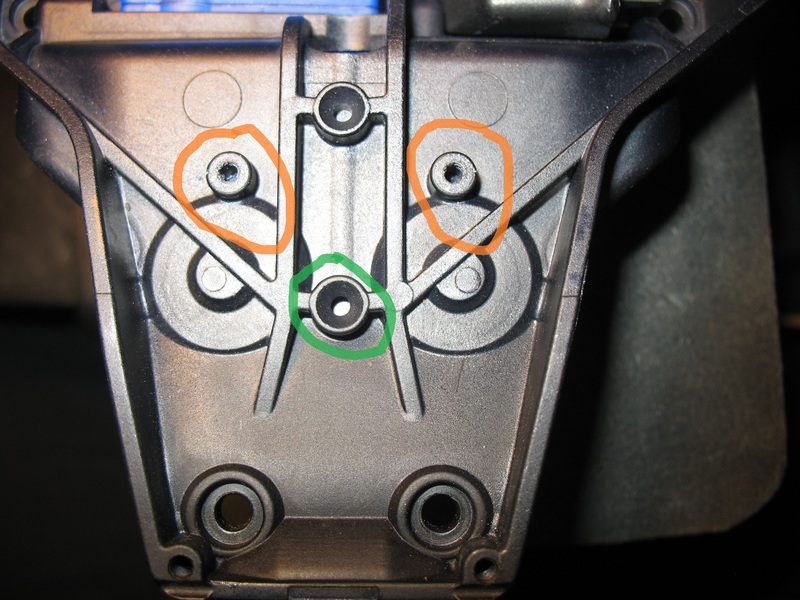 The hole I have circled in green will hold the head of the screw that will be used to attach the body post to the mounting plate. This is how I am going to mount the body. The plan I have for using the Nerf Bars on the chassis will hopefully remove any body flap I will have from using only two mounting spots. 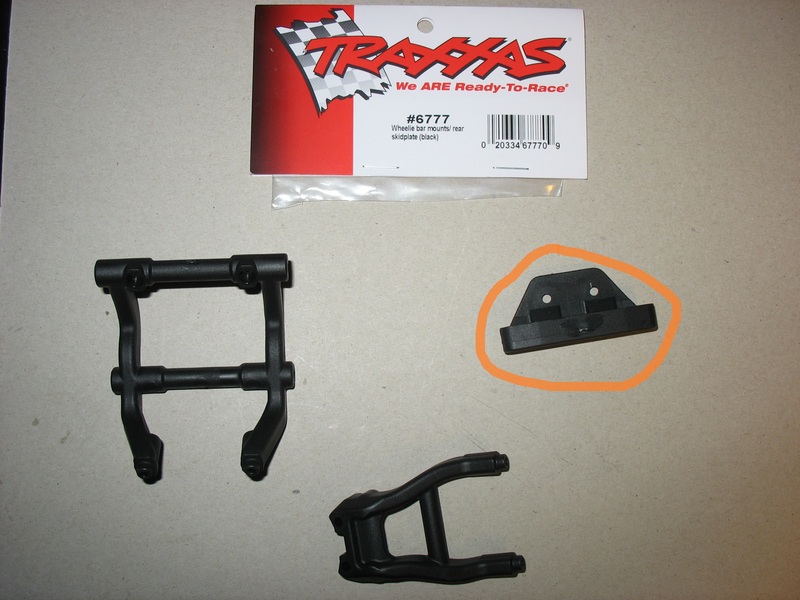 Traxxas Wheelie Bar Mount/Rear Skidplate Set. Part# TRA6777. Traxxas Body Mount & Post Set. Part# TRA6815R. Next time I will show you what I come up with for the Front bumper.